I started wearing makeup in fifth grade. Not a little lip gloss, but a full face of makeup—which many times made me look like I had a black eye. I eventually learned how to tone it down, but I’ve always worn more makeup and felt more dependent on makeup than my friends. Because I started so young, I’ve seen my face more often with makeup than without, and from that early age, started feeling like without makeup I just wasn’t pretty. In the last five years, I’ve really challenged myself to wear less makeup and own my natural look. 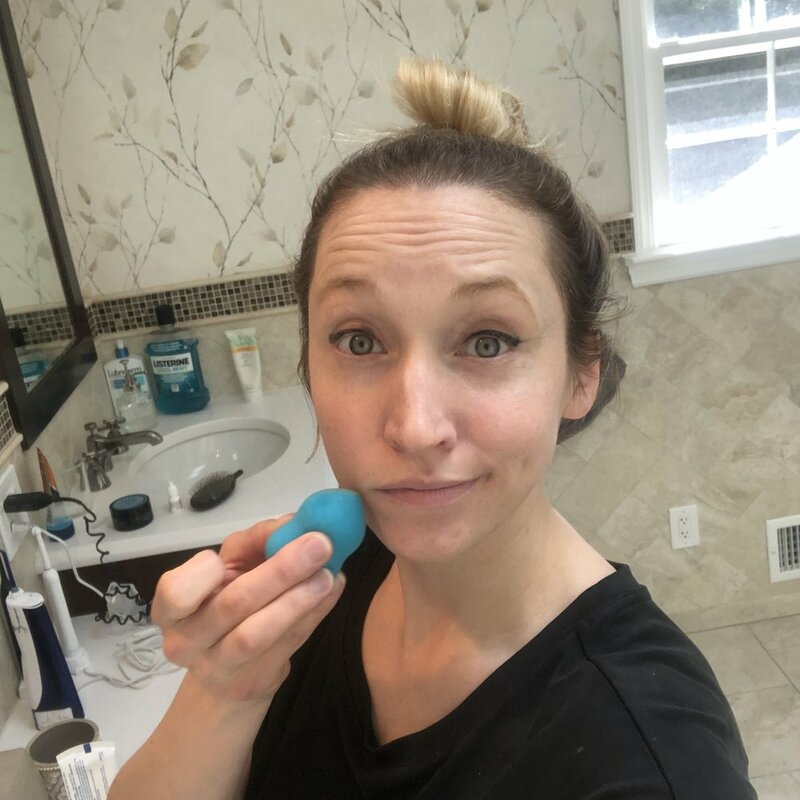 And honestly, it wasn’t until our Bluebird + Blackberries No Makeup Challenge that I truly broke free of feeling like I had to wear at least a little something to leave the house. I’ve always had a lot of makeup around, and very, very little cleaner for my makeup tools. A couple of years ago, I bought my first makeup cleaner (so yes, that was the first time I ever cleaned my brushes!). But I found the cleaning process so hard! It took so much time to get all the makeup off my brushes that I started doing it less and less. Since my twins are eight months old now, and I know the last time I cleaned any of my makeup tools was a bit before that, I would say it’s been a year, at least. And the only thing I was cleaning consistently was my beauty blender sponge. Because it was handling my foundation, which is wet, and because I use it every day, I figured if I was going to put in the effort to clean something, that was the priority. The problem is, I feel like no matter how much I wash it, I never get all the makeup out of it and eventually I give up and figure it’s at least a little better than when I started. The only thing I could come up with was to replace it more often. But at about $20 a pop, it doesn’t feel so disposable. From left to right: white triangle sponge, mini sponge, Up&Up sponge, orange sponge. an orange sponge, which came with a carrying case ($8.19). I liked the idea of the old school white sponge because at less than 5 cents a sponge, I really could use a new one every day (though I don’t love the idea of the extra garbage). Well, after a couple of swipes, I realized why I hadn’t used a sponge like this since high school. It soaked up all the makeup and deposited little on my skin. It just didn’t work; it was a total fail. However, the three remaining sponges all performed similarly to that first one. If I used them to smear the makeup onto my skin, they just didn’t leave the makeup there, and instead scooted it away. BUT if I deposited the makeup with my hands and then patted it with the sponges, the results were great. I love using a sponge to blend because you don’t get lines of makeup and the finish is so natural. These sponges did that, but it felt like more work. In the end, my favorite choice was the mini sponges. The bigger ones didn’t do a great job with applying makeup right under my eye—in the corner—but these got right in there. And maybe because they were smaller, they were more flexible and did a better job moving the makeup around and not just wiping it away. At about $2 a sponge, I could definitely replace them more. So they’re a good option. In the end though, I had to really ask myself, do I care if my sponge is dirty? Of course, I get the idea that it’s moist, can grow bacteria, and is a little gross. But has it ever really affected my skin or health? 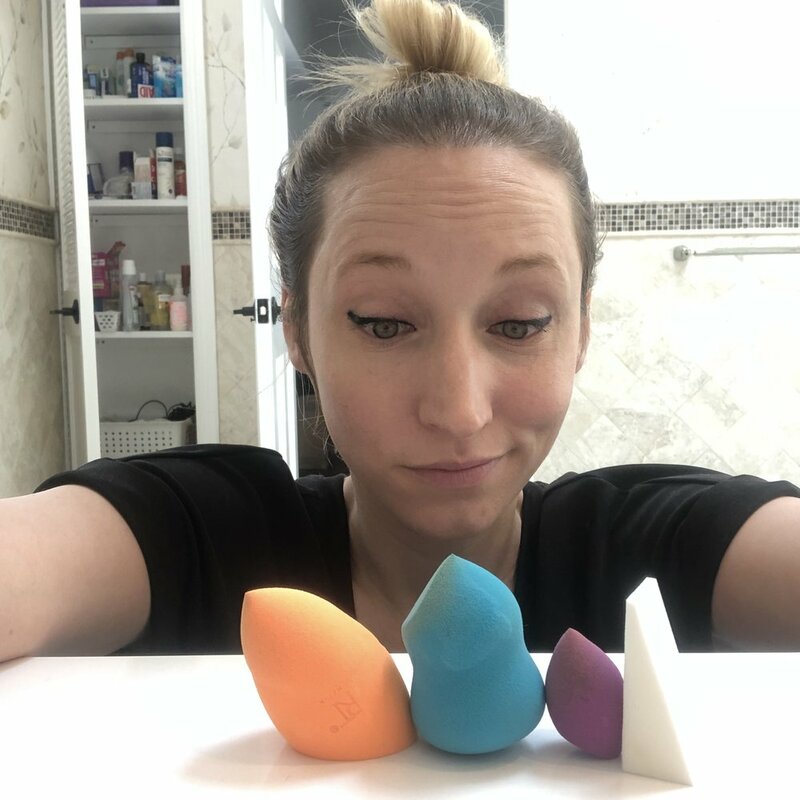 So I think I’ll commit to changing my original beauty blender every four to six months instead of once a year. There are deals every now and then; for instance, after the holidays I’ve found holiday colors that no one wants any more for cheap, so I’ll be on the look out for that. But in the end, I just don’t need to add any extra steps to my makeup routine, and that includes cleaning my sponge. Does that make me a dirty bird?